Canon provide a free plug-in to enable the C300’s MXF files to import directly into FCPX without the need to transcode to ProRes. Many users report that they have no problems with the installation and it ‘just works’. However, other users with similar setups report that they cannot import C300 rushes in FCPX, though it works through Log and Capture in FCP7, additionally Adobe Premiere successfully imports C300 MXF. 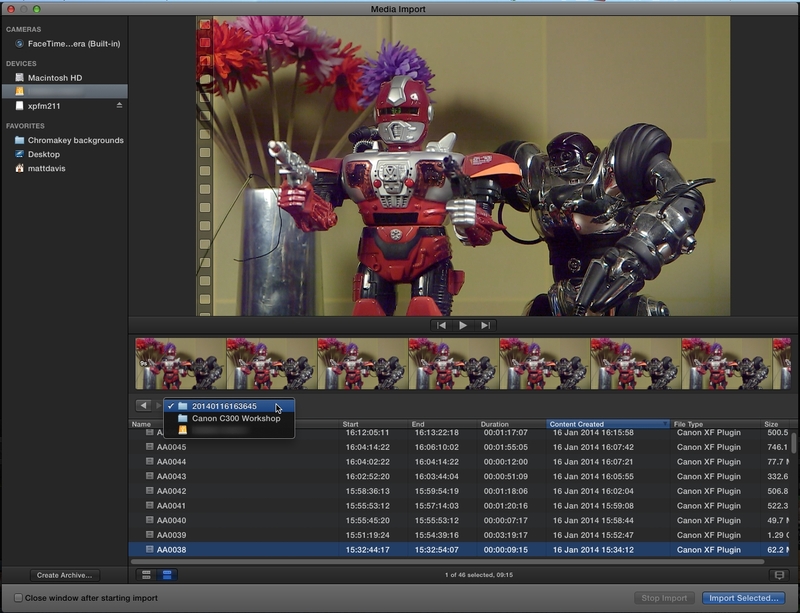 Only FCPX seems affected, and for a limted subset of FCPX users. 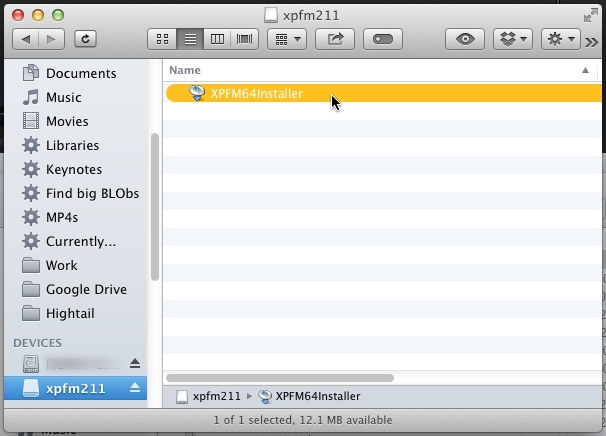 Here’s the typical scenario: having run the xpfm211 installer. 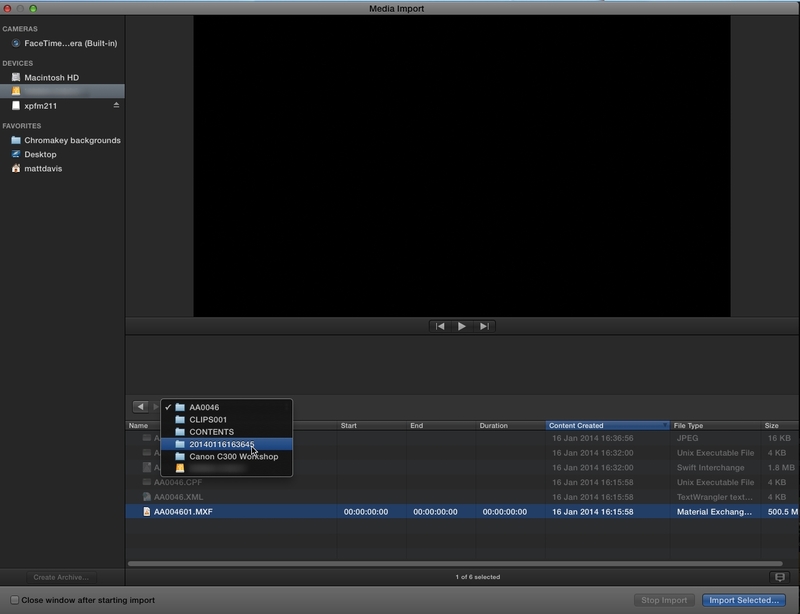 FCPX sees the folder structure, even the MXF files themselves, but does not recognise either. This is as far as some users get. For some reason, the installer has completed successfully, we are seeing files, but nothing imports. De-installing and re-installing brings the user back to this situation. Very frustrating. 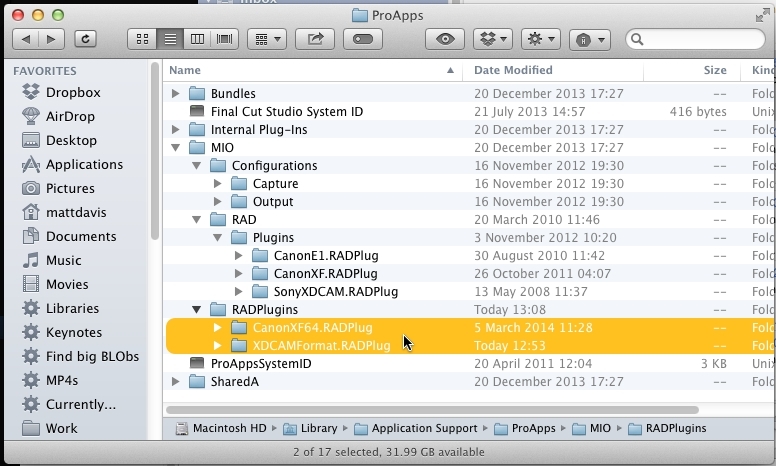 Trying to track the activity of the installer, we see two new plug-ins highlighted in the MIO/RAD/Plugins folder – CanonE1.RADPlug and CanonXF.RADPlug. The latter would appear to be the ‘magic smoke’ for the MXF format. However, this isn’t working. 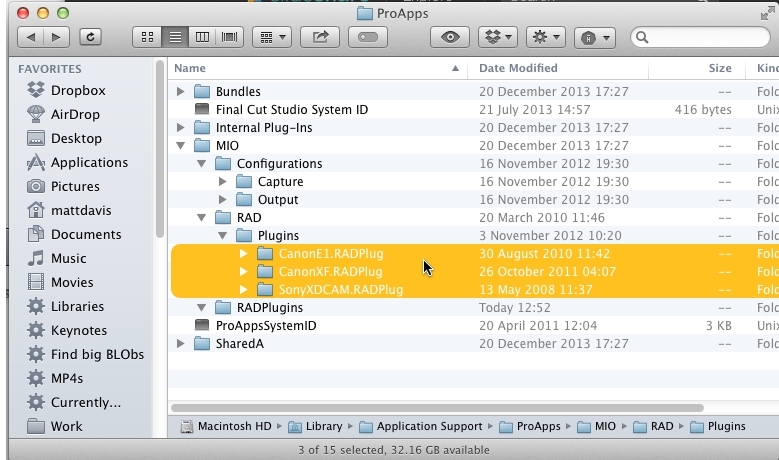 There’s a second empty RADPlugins folder below – should the plugins be in there? Whilst it may seem a bit ‘cargo cult’ to shift the contents from a RAD/Plugins heirachy to a RADPlugins, it was worth a shot. No, it didn’t work. Here’s where it got interesting. I was able to confer with another editor who had a system that did import MXF successfully. The key difference was that he had a CanonXF64.RADPlug folder – not an XF, an XF64. I could not find a similar folder, nor could I make the installer create one. In the end, he just sent me a copy of that folder, and I dragged and dropped it into the same folder I had. And it worked! It’s pretty obvious because you can see the clips, but also note that the MXF folder heirachy has gone, replaced simply with the usual list of clips on a card or archive. So this folder appears to be the missing link. Depending on your system, the installer either creates this folder, or it doesn’t. 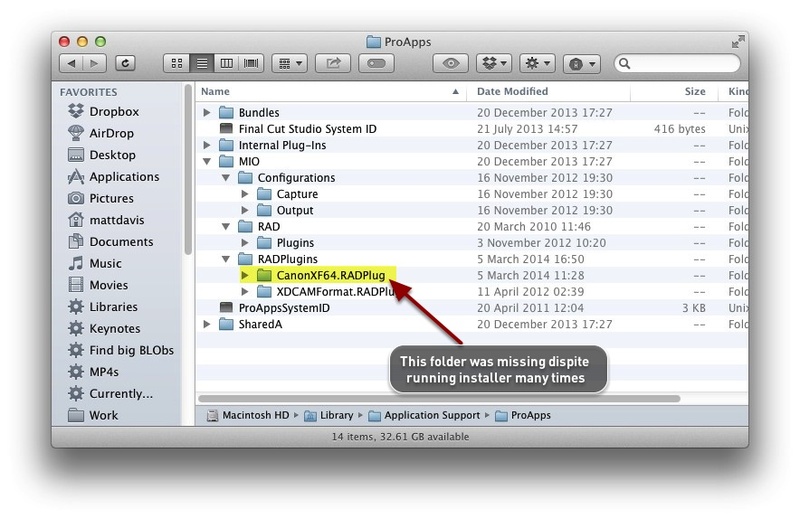 Both of us had the XDCAMFormat.RADPlugin, removing both did not make my installer create this file, the only way was to use somebody elses copy. It would be useful to provide this folder as a download to those who need it, but license agreements seem to forbid this sort of activity – probably for good reason. It comes down to an issue with the installer, which isn’t written by Canon staff, and so it’s difficult to work out who to alert to the situation. However, as seen here, access to the CanonXF64.RADplug folder cures the problem for now. This entry was posted in Cameras, Editing, Encoding and tagged C300, Canon, FCPX, import, Ingest, MXF by Matt Davis. Bookmark the permalink.